Sweden was stunned by two quick goals from Emre Akbaba in the closing stage of the game against Turkey to lose the game 3-2. 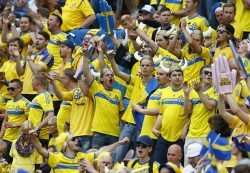 Sweden thought that they had made the most difficult thing by scoring two goals in the 34th and 49th minute of the game in order to lead 2-0. But they will concede the first goal in the 51st minute before conceding two quick goals from Akbaba in the 88th and 92nd minute of the game. Sweden started the match the better and was the most comfortable team in the first half creating numerous occasions. They will open the scoring in the 34th minute thanks to Isaac Kiese Thelin after some brilliant work from his teammates. This will be the only goal in the first half and the teams will reach the break with the score 1-0 for the Swedes.